Ever want the beautiful flavors of the Mediterranean on a purely American burger? Try this grilled delight with the Tzatziki sauce for an amazing combo! In a small bowl mix together the tzatziki sauce ingredients, cover with plastic wrap and place in the refrigerator. In a medium bowl mix together the ground beef, oregano powder, basil, thyme, onion powder, garlic powder, salt and pepper. Divide the mixture into four, 4 oz patties. Slice the red onion into four ½” thick slices and brush with olive oil. Place all four burgers on one side of the preheated grill and onions on the other side. Place the lid on the grill. Grill the burgers for 3-4 minutes per side for medium rare, and 5-6 minutes per side for medium. 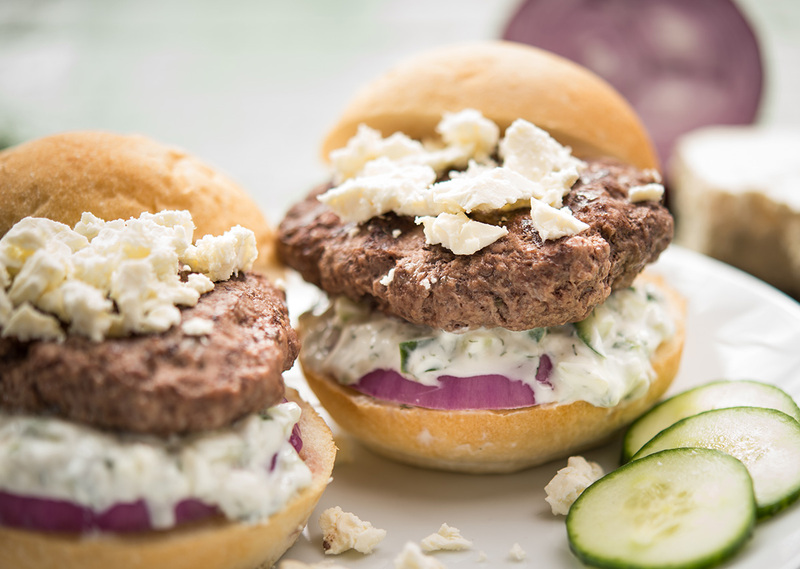 Top each burger with 1 Tbsp of feta cheese and grill until melted. Grill the onions for 3-4 minutes per side. Serve burgers with grilled onions, tomato, lettuce and 2 Tbsp tzatziki sauce.